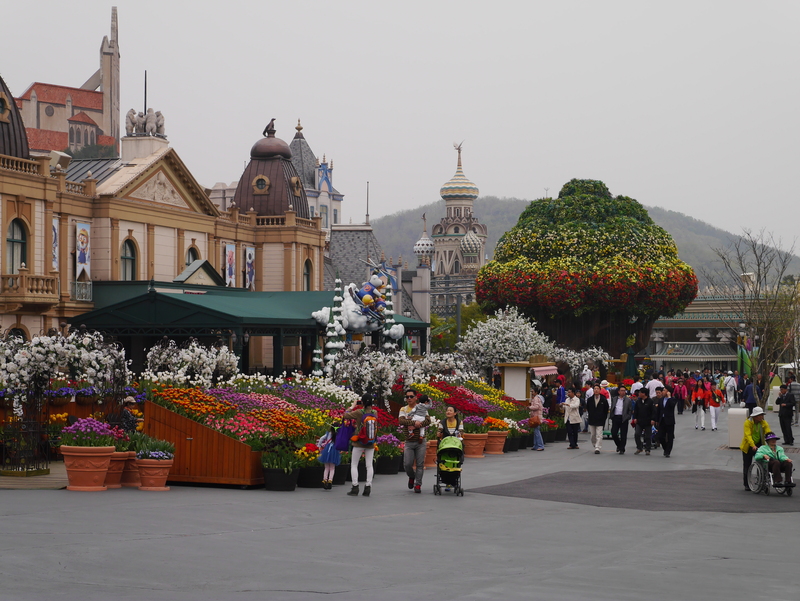 On Thursday, all of us, including Dan, went to South Korea’s amusement park, Everland. Dan was able to take off Thursday and Friday and hang out with us so that awesome! 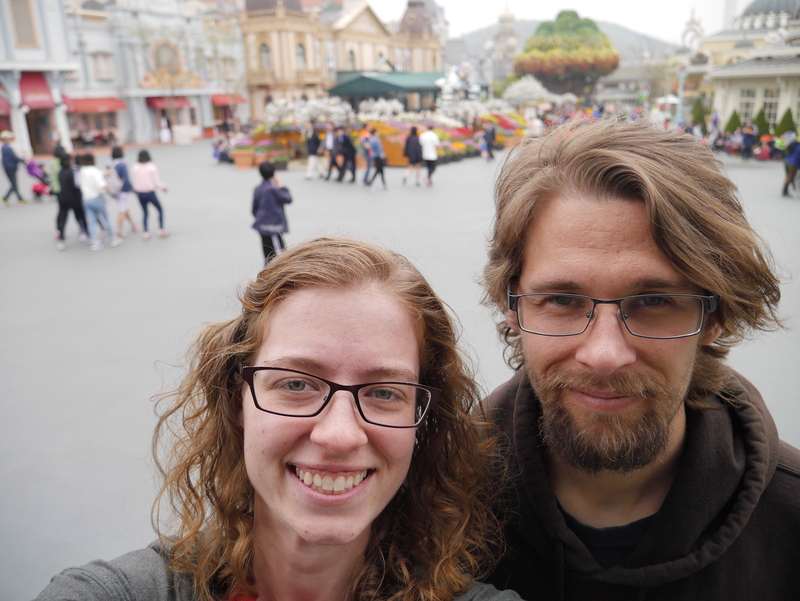 Everland is a park full of rides, food, shows, and a miniature zoo. We got there in the morning before it opened. Loads of school children also showed up around the same time. I’m bad at estimating people, but I’d guess there were at least 1 thousand kids there. It was a bit crazy and crowded in the morning but by the afternoon the majority of the kids had left. When the park opened we headed to the zoo area first and took a safari ride. That was such a great way to start the day. We saw giraffes, lions, zebras, elephants, and other African animals. 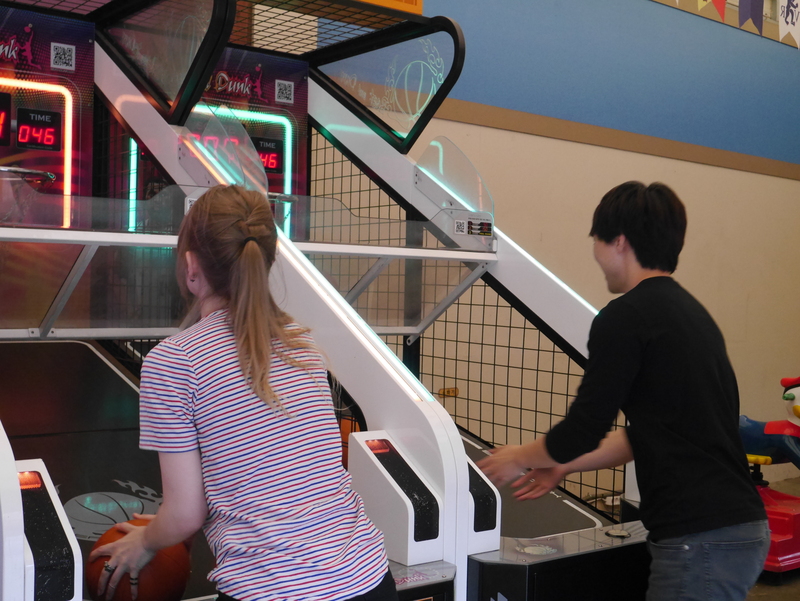 Although I didn’t understand the tour guide, I still had fun. 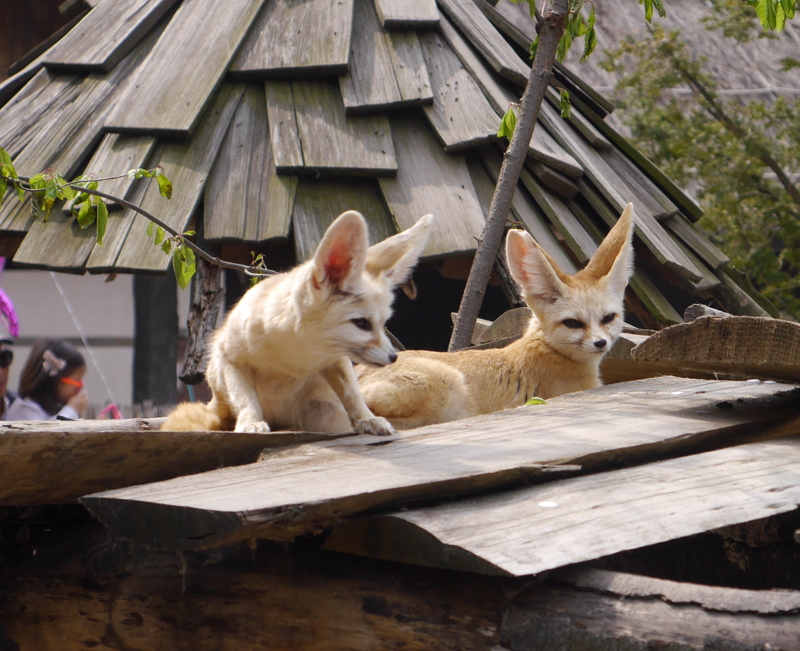 It was awesome to see animals, they’re just so cute! 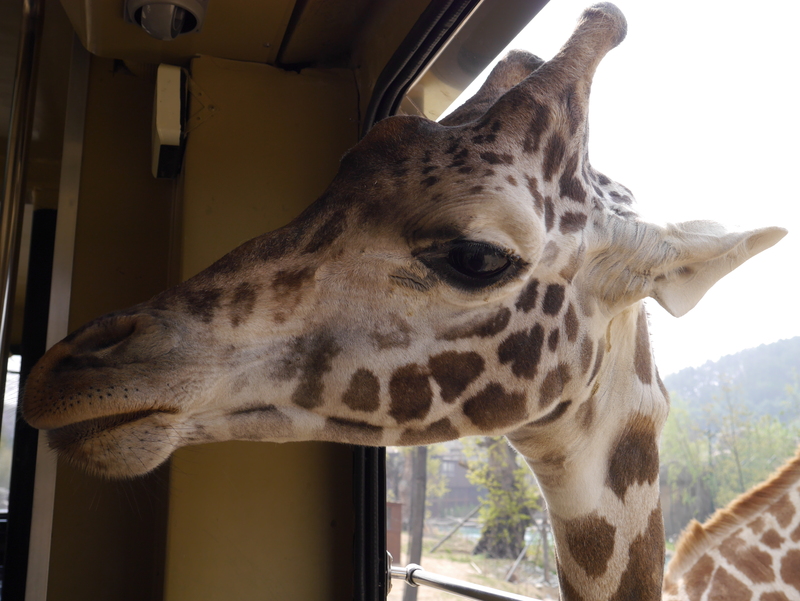 We got fairly close to them and the tour guide even fed some of the giraffes, they stuck their heads into our truck! After the ride we walked around the zoo for a bit before heading back out into the park. There were tigers, kangaroos, fennic foxes, and lots of awesome monkeys and apes. They even had a baby tiger, baby orangutan, and baby lions! I’m always very conflicted when I go to zoos because of the space these animals have but I did enjoy myself that day. I just hope that all these animals are taken care of at the park. We also went on this ride that was a rip off of “it’s a small world”. It was called Global Village and was kind of depressing and a bit creepy. Some of the dolls looked pretty old and dirty. The U.S. section was full of dolls playing football and dolls dressed in red,white, and blue. There were some buildings, one of which said “Imperial” on it. Quite interesting. I wonder if that’s really how South Koreans see us? 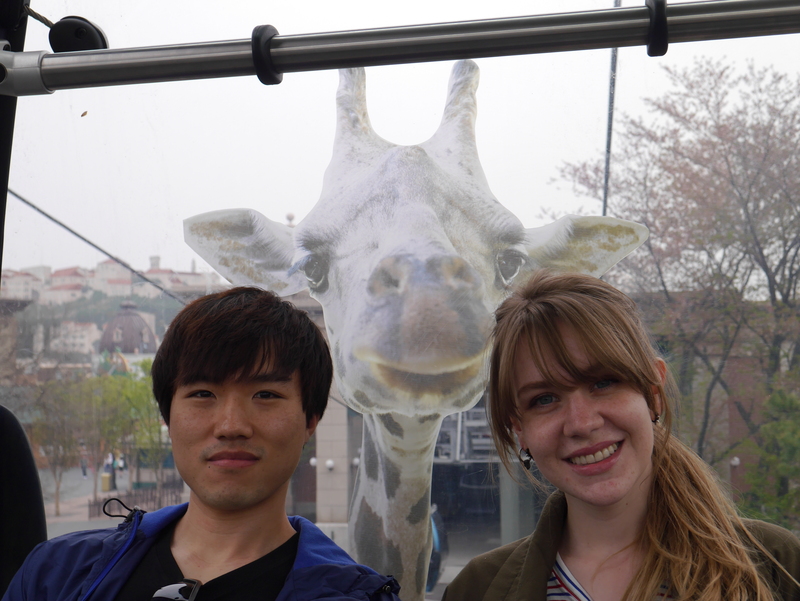 It was fun to go on the ride and see South Koreans’ interpretation of what other countries are like. But still, maybe they shouldn’t have ripped off Disney’s ride? I had some good food while we were there too. I had a hotdog cooked into bread, like a pig in a blanket. That was delicious and exactly what I needed. Gene bought this cool Swedish dessert that was basically fried dough with chocolate on it. That was tasty and also what I needed. Had a bit of popcorn and a churro too. After eating some food we walked around this beautiful tulip garden. 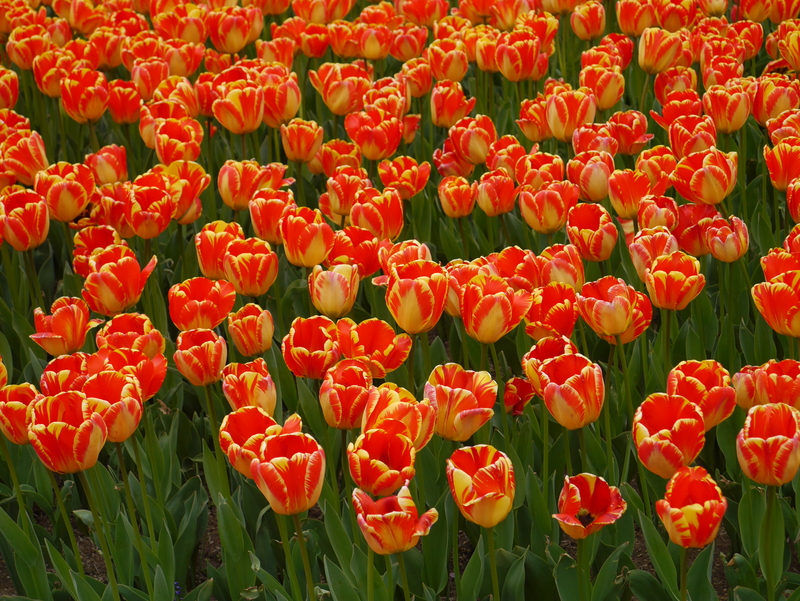 So many tulips, all such lovely colors. I really like flowers, can you tell? They only have this garden in the spring so we made it just at the right time! In the afternoon we watched two animal shows: a water one and a land one. They were both so enjoyable and possibly one of my favorite parts of the day. We saw seals, birds, and sea lions in the water show. They are adorable and so smart. I have no idea how they were trained but they seem to have memorized everything, it’s quite impressive. The land show had dogs, guinea pigs, birds, an orangutan, ferrets, and more. Yet again everything was cute and made me want to get a pet. This show was Tarzan themed and was so fun to watch. It started raining in the evening so the outdoor rides shut down. Our last stop was the hologram concert, which I thought was really cool. For a second, when the band appeared, I thought it was real people and thought we had been tricked. But it really was a hologram. There were moments when I thought to myself, “these really look like physical people.” The technology is getting better I think, although we’re not quite there yet. Even so, I had a lot of fun and danced around. We browsed the souvenir shop for a bit before heading back home and me crashing shortly after. It was a long, fun day and I slept well that night.